My duck egg blue bag that I am using for Spring, it fits everything and looks so cute! Discovering beautiful Spring / Summer clothes that I forgot I owned because I stashed them away during winter. Looking forward to seeing ornamental cherry trees with pink blossoms on them! Yay for Spring! Looking at my wedding photos and feeling all happy inside! Washing make up brushes.. I have far too many. I will select a few that I use daily and keep the rest out of sight so that at the end of the week, I only have a handful to wash as opposed to a mountain! Eating chocolate, the past week I have eaten SO much. It's time to really toughen up. Spending stupid amounts of money on beauty products. I have decided I will make a make up fund and aim to add a few £'s here and there so that when a Limited Edition collection pops up, I will only buy what I can afford! What are your in's and out's? I totally agree with the make up brushes and spending too much on beauty! Theres always something tempting and i'm going to join you on the spare change idea. Having said that...the bamboo bronzer is a complete need in my life! I'm going to try to be strong. I remember when you posted your wedding pictures (a year ago now??! )..absolutely stunning..both weddings! Your purse is so cute and I love the color! I'm all with you on the chocolate part! I need to go low carb again!! That bag is a perfect color! I am so excited for To the Beach!!! AGH! That bronzer is so pretty!! I LOVE your bag! That colour is so in for this season! Are those bronzers above from Guerlain or Lancome Muhsine? Because they are gorgeous!!! And I love your bag btw...perfect for Spring! Oh, the bronzer is by Lancome...sorry, I didn't read properly! LOVE your bag! it's such a gorgeous color! and the rosette detail is super cute! and i think your make up fund idea is great! i think i'll open up another "savings" account with my bank and just set that up as my make up fund. Where is your bag from? Duck egg blue is my favourite colour, and that bag is so pretty! I love getting my wedding album out, it always cheers me up on a bad day! 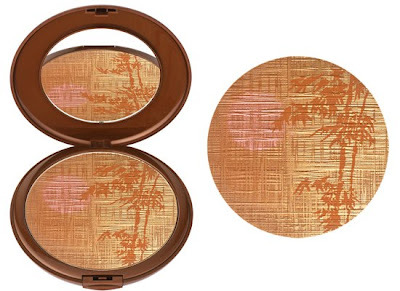 whoa..that's a pretty bronzer..i knew my bronzer lust would never be over! i just posted on the guerlain one, but i love the little graphic on this one. Spending money on beauty products! It's hard beacuse I wear a uniform to work so the only thing I have left are my eyehadows and lipsticks. Just wanted to let you know that I tagged you in my blog post, as I think your blog is lovely. Hey i was wondering could you do a post on eyeliner like how to and stuff?